← UPDATE: NOT GUILTY! Kansas City Royals Mascot on Trial for Assaulting Fan with a Hot Dog! 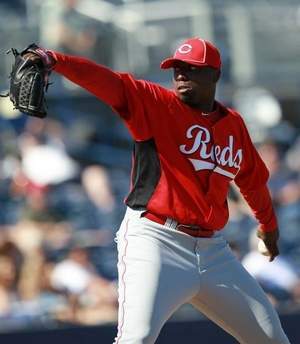 Cincinnati Reds Pitcher Dontrelle Willis Sprains Ankle After Tripping on BAT! Yet another strange injury. Dontrelle Willis left the Cincinnati Reds’ 7-6 victory over the Chicago Cubs after spraining his right ankle after he tripped over a bat! Willis, trying to win a spot in the Reds’ bullpen as a non-roster invitee, was injured while backing up home plate in the fifth inning after the Cubs Bobby Scales hit a two-run single. He limped back toward the pitcher’s mound, and was taken out of the game before facing another batter. The big left-hander recorded just one out Saturday and was charged with four runs, two earned. Willis had been on a roll entering the game, having pitched scoreless two-inning outings his last two times on the hill. This entry was posted in Chicago Cubs, Cincinnati Reds, Injuries, Relievers, Spring Training, Strange and tagged Baseball, Bobby Scales, Chicago Cubs, Cincinnati Reds, Dontrelle Willis, Dusty Baker, MLB, Spring Training, Strange Injuries. Bookmark the permalink. 1 Response to Cincinnati Reds Pitcher Dontrelle Willis Sprains Ankle After Tripping on BAT!